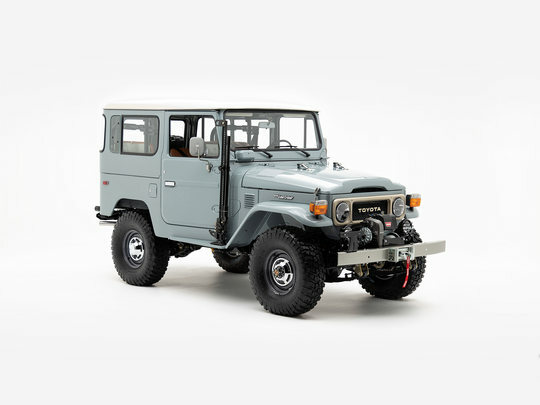 For our client, a military man, the FJ40 is a ride that feels familiar, yet refined. Its cool vintage looks and classic engine make it the perfect Land Cruiser for an off-duty mission, or a relaxing cruise along the French coast. This is a Land Cruiser that feels like it was made to be near the water. Its original armor perfected and repainted in the seaside shade of Heath Gray (113), and equipped with an array of accessories that complement its off-road nature. LED lighting brings a wider range of visibility in all conditions, while a new set of BFGoodrich® Mud-Terrain tires gives this ride an extra dose of je ne sais quoi. If you grew up with an old-school Land Cruiser, the sound of the 2F engine never fails to bring a smile to your face. But this time, all of that nostalgia is fined-tuned and paired with the essentials no modern driver should be without: an upgraded Old Man Emu suspension, Advanced Power Steering, and front disc brakes. This FJ40 cabin is handcrafted with all the retro-cool details our client remembers, and all of the creature comforts today's drivers demand. Beautifully stitched bucket seats hold the driver and passenger in place, while vintage-style knobs control the temperature, fan, hazard lights, and more. The built-in audio system is iPhone®- and Bluetooth®-ready, making this FJ40 the perfect companion for our client’s next road trip. The retro look you love now comes with a modern powertrain. Build your own G40 Heritage by The FJ Company!